90 Minute Block Emaze Presentation to be viewed with 90 Minute Block YouTube video for narration. 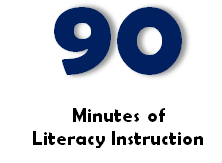 THANK YOU to these willing teachers for allowing us to record them during their 90 minute literacy block! and the ideas of readers. This printable chart guides students to the appropriate evaluation of spoken or written arguments/claims. Stage for Learning provides a variety of vocabulary and writing resources for second and third grade. Plew Elementary resources includes Kindergarten-5th grade units.